Classical mechanics, lasers, E&M, Mars, squirels… follow me through my distracted life as an Applied Physics undergraduate. Jason R. Stockton, Benjamin (Adam) Catching, and Dr. Anna Petrova-Mayor CSU Chico, Department of Physics Introduction: Metal-coated mirrors are commonly used in optical instruments. When light is reflected off a mirror, its polarization may change depending on (1) the coating (material, number and thickness of layers), (2) the angle of incidence, and (3) the orientation of the mirror (azimuth angle) with respect to the incident polarization. Understanding of these changes is of particular importance for polarization sensitive instruments. We performed a series of measurements and characterized 4 sets of mirrors with different coatings (off-the shelf and custom designed). Here we present the experimental results and analysis and outline the theoretical background that we will use next to model the observed phenomena. Experiment: Vertically polarized beam at 1543.7 nm is incident on the laboratory beam scanner. The beam is steered in azimuthal and vertical (elevation) direction via the rotation of the first and the second mirror, respectively. The state of polarization (SOP) of the beam for any pointing direction is measured with a polarimeter. The experimental data are compared in figures 1-2 and summarized in table 1. Theory: Metal-coated mirrors are of low cost compared to multi-layer dielectric mirrors and are thus the choice for large optics (e.g for telescopes or scanners). The metallic coating is deposited on a glass substrate and covered with a thin dielectric layer (such as SiO2) that protects the metal against oxidation and scratches. The biggest disadvantage of metallic coatings is that they absorb light and therefore their reflectivity is limited to 96%–98%. The reflectivity can be enhanced by the use of several layers of dielectric coatings. The principle of operation of multi-layer coatings is explained in Fig. 3. The amplitude reflection coefficients and the accumulated phases upon reflection are different for the s- and p-polarization ()and(). Therefore, the state of polarization (SOP) of the reflected beam may differ from the SOP of the incident beam. We call this effect depolarization caused by the mirror. To calculate the transformation of the SOP of the incident beam, we plan to use the matrix method from Mayor et al. The transformation matrix, its elements, and the related coefficients are defined below. Further work is required for the calculations/measurements of the amplitude coefficients and the phases. Conclusions and Outlook: The obtained data show that the aluminum mirrors depolarize less than the gold mirrors and the enhanced coatings depolarize less than the protected coatings. The orientation of the ellipses for all mirrors consistently follows the azimuth angle. The next task is to develop and apply the theoretical model for the mirrors and compare the theoretical with the experimental results. 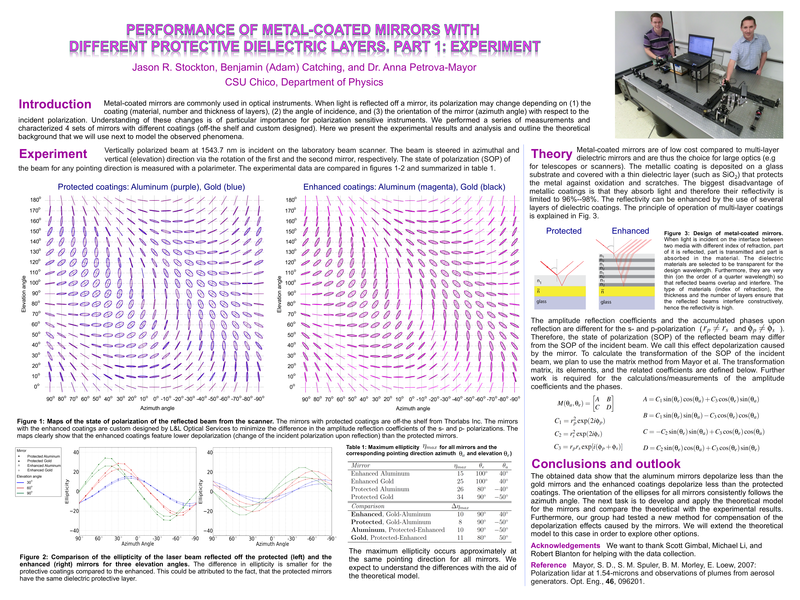 Furthermore, our group had tested a new method for compensation of the depolarization effects caused by the mirrors. We will extend the theoretical model to this case in order to explore other options. Reference: Mayor, S. D., S. M. Spuler, B. M. Morley, E. Loew, 2007: Polarization lidar at 1.54-microns and observations of plumes from aerosol generators. Opt. Eng., 46, 096201. Thanks: We want to thank Scott Gimbal, Michael Li, and Robert Blanton for helping with the data collection. NewSpace Keynote Presentation | Escape Dynamics …. magic?